Update on 12/07/2017: Pebble has officially announced that it is shutting down and Fitbit will be acquiring its software assets. This is the end of an era. Pebble has helped change our culture by making the smartwatch mainstream. I’m excited to know if there will be a place in the future for a similar smartwatch but for now I’ll continue to use my Pebble Time Round until it dies. Which of the available smartwatches today would you think would replace Pebble? The smartwatch is not a fad that’s going to fade away. There are more options available today compared to 2 years ago but 2 options stand out for me. The Apple watch dominated the smartwatch market in 2015 and it is forecasted to continue to have a strong lead until 2019. The Pebble watch had a great start as the most funded project in kickstarter but its future remains questionable with a rocky 2016. I have owned both the Pebble Time Round and the Apple Watch but ultimately decided to keep the Pebble Time Round. I really wanted to like the Apple watch more since I own multiple Apple devices – Mac, iPad and iPhone. It seemed to make sense if I also own the Apple Watch. Unfortunately, the Apple Watch and I were just not meant to be. Eventually I sold my Apple watch. Both Apple and Pebble are releasing new versions of their watches but I’m still keeping my Pebble Time Round. Let me share with you why I chose it vs. the Apple watch. The always-on screen of the Pebble watch makes it seem like a regular watch. While using the Apple watch, I had to learn to look at it from a certain angle so I can check the time. Being a watch wearer almost my entire life, I already have muscle memory on how to do quick glances on my watch. Unfortunately this doesn’t work with the Apple watch. There’s a certain angle needed to display the time. It irritated me so having an always on screen is now a non-negotiable feature that I need from a smartwatch. Because of the always on screen, watch faces are more appreciated in the Pebble watch. There’s so many choices available depending on your mood or outfit. For some time, finding the perfect watch face has become an obsession. Warning: it can get addicting! The Apple watch only has 10 watch face templates to choose from that you can further customise. But because the screen display is not always on, it’s difficult to appreciate these watch faces and the number of watch face options available just pales in comparison with Pebble. Some may argue that the retina display of Apple is far superior compared to the low-resolution display of the Pebble watch. Yes this is true, so you would have to choose your priority. With Pebble, you can get more battery life and an always on screen. While with the better display of the Apple watch, the screen is not always on and battery life is mediocre. Pebble watches use standard bands. The Pebble Time Round I’m using has a 14mm size band. I have found so many options (and affordable ones) from shops that sell watchbands. I currently own 5 bands already and counting! More and more third party bands are becoming available for the Apple watch but they cost more than the options available for Pebble. The Pebble notification system is very simple. It mirrors the notifications settings of your phone. I can glance at all of the notifications I have received and check if there’s anything I need to reply to. On the Apple watch, it’s trying to be smart, if I’m using my phone passively such as using navigation or streaming music, the notifications don’t get displayed on my watch. The notifications summary was never accurate for me. The Pebble time round has been quoted as the thinnest smart when it was launched and it does feel like a normal watch. I forget that I’m wearing a smartwatch. It does not feel intrusive or uncomfortable. The Apple watch on the other hand is very noticeable, I feel fatigue after wearing it for quite sometime. The Pebble time round has the worst battery life among all of the Pebble watches but getting almost 2 full days on it is still a lot better than the Apple watch’s average of 18 hours. Since the battery of the Pebble Time Round is small, you can charge it full for only 20 mins. I get to wear it all day including the entire nighttime to monitor sleep. I only charge it when I take a batch and prepare for the day and I never get to worry about running empty. Pebble health includes a sleep tracker. Just wear your Pebble watch while you sleep and you’ll be able to monitor your sleeping pattern and trend. Sleep is very valuable for me and I have a personal goal of achieving at least 40% of deep sleep. Having this sleep tracking feature built-in helps me track my progress. The results from Pebble health are more accurate compared to the other app I use – Misfit. It’s a good indication that the collaboration of Pebble with Stanford University in developing Pebble Health is yielding positive results. I prefer the use of the physical buttons on the Pebble watch compared to touchscreen. It’s more simple and intuitive. I can mute my watch, snooze my alarm while half-asleep and control music from my phone all from the watch without having to glance at it! The reason why I chose the Pebble time round vs Pebble time is because of its style. The Pebble time round looks like a regular watch with its round shape and thin profile. I don’t like to wear a watch that screams smartwatch or that would look bulky and sporty. I’d like to have a smartwatch that I can easily customise and use for formal events. I have very thin wrists so wearing a regular smartwatch is awkward. I must admit the Apple watch space grey stainless steel is beautiful to look at with its shiny black screen but it’s still too bulky and sporty for my taste. I find the Pebble timeline very useful in showing my calendar and reminding me of my next meeting. The alarm app is used daily during workdays and the health app is used to monitor my sleep. Apart from these, I seldom use apps on my watch. I looked forward to using apps on the Apple watch but was disappointed on how slow they load, I’d rather just pick up my phone and use the app from the phone. I’ve shared my reasons for using a smartwatch and using apps is not a priority. I am currently using an Apple iPhone but used to own an android phone so I am not a loyal iPhone user and getting an Android phone in the near future has a possibility. I love the fact that whatever phone I choose next, I can continue using my Pebble watch. Apple for now is limited to iOS – iPhone is a must. The Apple Watch series 2 is now available but since the always-on screen is a non-negotiable for me, I have not considered getting one. How about you? 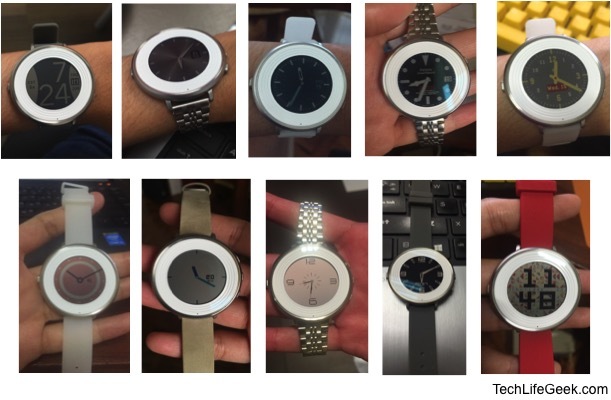 Are you using the Pebble time round for the same reasons? Or are you using the Apple watch or planning or planning to get the Apple watch series 2? Reply back with your comments below and subscribe to my newsletter to get updates. For Pebble Time Round users, please check out my Tips here. Hi TLG, I haven’t tried Pebble Round, but I did try the first two Pebble watches. Your reasons for choosing the Pebble over the Apple Watch are very compelling. I chose the Apple Watch instead, but I have different priorities. I use my Apple Watch as a fitness monitor throughout the day. When I wore the Pebble watch I used the Nike FuelBand as my fitness monitor. You’re right, having always-on is fantastic, but I find that a slight turn of my wrist illuminates my Apple Watch screen and that has become a habit. A sleep tracker would be great, as would longer battery life. But I found with the Pebble that I totally forgot to charge it, because the battery lasted so long. I sometimes would be out and about when the Pebble needed charging which didn’t work well for me. I plug my Apple Watch in every night, as a habit, along with my iPhone. I like being able to respond from my watch to text messages, tweets, Facebook messenger and phone calls. I also like being able to text and make phone calls from my Apple Watch, in a pinch. I use many apps on my Apple Watch, including an app that shows me where the best gas prices are. I can glance at my wrist when I’m stopped at a light and know where I should head to fill up. I like the brighter screen of the Apple Watch, especially in sunlight. I was having problems seeing the Pebble watch face in bright light. I have a couple of custom watch faces on the Apple Watch, including one filled with complications that give me all kinds of fun and useful data. I also have one with a very special photo on it that my Apple Watch app on my phone suggested. I have a collection of fun Apple Watch bands from Casetify, including one I made from a photo. They give me a lot of choices, unless Apple changes the compatibility of the bands. 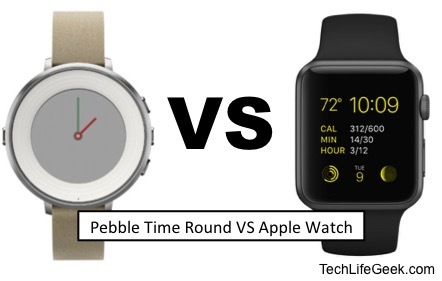 The Pebble Round is definitely more attractive than the Apple Watch. Excellent article, I wish you many years of happiness with your Pebble! Hi Carolyn, thanks for providing your perspective on the Apple Watch and I am glad that it’s working well for you. Pebble watches definitely have lesser features on iPhones compared to what they can do on Androids such as replying to messages. You are right, we all have different priorities and needs. The good thing is that we now have a lot of good choices from the market and these watches just keep on improving! Who knows, I might be wearing the Apple Watch Series 3 in the future but not anytime soon.